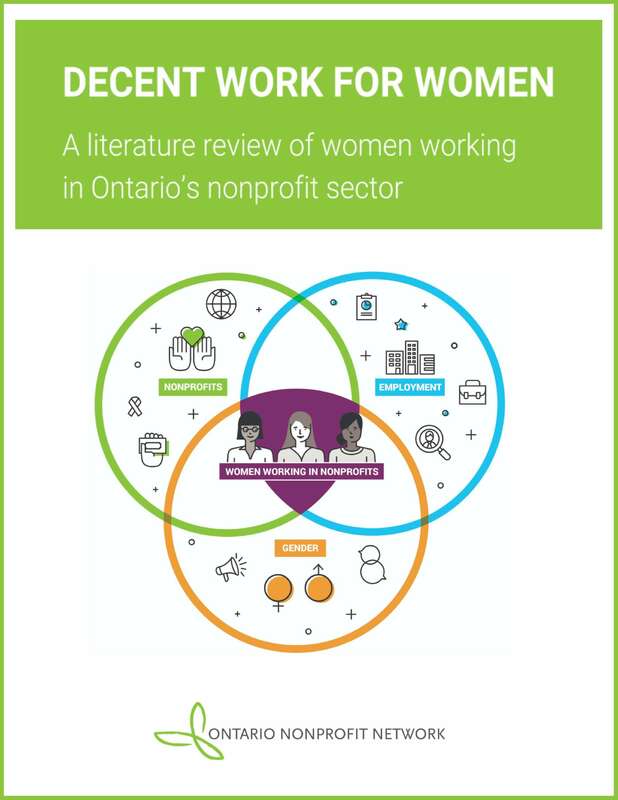 The nonprofit sector in Ontario is women-majority as 75% to 80% of the workforce is women. While the sector has more women in leadership positions than the public and for-profit sectors, the 75-80% employment share is not reflected at the leadership level. Women are underrepresented in senior leadership positions and men are overrepresented. Women are more likely to lead smaller organizations, and smaller organizations make up a large part of the sector. Immigrant and racialized women are concentrated in the immigrant, refugee and settlement services subsector where they also make up a majority of the workers. They are more likely to be in frontline rather than senior leadership positions. Overall, there is a lack of data on how many immigrant, Indigenous and racialized women, women from the LGBTQ community, and women with disabilities work in the sector. Nonprofit sector wages are lower than other sectors, in large part because of a phenomenon known as the “care penalty”, despite the fact the workforce is highly educated and experienced. Within the sector women experience a gender wage gap as they earn less than men, especially in senior leadership positions. Limited access to a pension plan and maternity top-ups in the sector are particular challenges to women’s economic advancement. Discussions on gender equity in the labour force tend to lack the nonprofit sector lens while labour force discussions on the nonprofit sector lack a gender equity lens. The only intersection between gender equity and the nonprofit sector to date has focused on clients and communities rather than nonprofit workers. While the review was able to locate some research on the experiences of immigrant and racialized women working in the sector, research on the experiences of Indigenous women, women from the LGBTQ community and women with disabilities working in the sector was not found. More information can assist in developing and implementing strategies and solutions for the nonprofit sector labour force that target particular challenges and that do not create adverse impacts. The gendered and racialized division of labour and the nonprofit sector’s labour market structures are interconnected, impacting employment trends in the sector. This understanding sheds light on the second learning, that broader gender and race labour force market patterns manifest in the sector, yet manifest differently in comparison to other sectors. From this review, additional intersecting questions on women’s employment experiences in the sector have emerged. Using ONN’s seven pillars of decent work, these questions interrogate what decent work for all women would look like in the sector. For instance, how does workplace harassment for women manifest in the sector? Do women negotiate pay? And why are women not in leadership positions in larger organizations? ONN will explore these questions in the second phase of this project and also call for further research on them.